2GETHERAUDIO RELEASES G8TOR, A SEQUENCER SYNTH WITH LIVE ACTION PAD EFFECTS – FOR MUSIC TRACKS NEEDING SOME SERIOUS ANIMATED BITE. Boston, MA USA (January 8, 2019) – 2getheraudio, (https://www.2getheraudio.com), has released a unique software synthesizer built around three step sequencers add DJ-style pad triggered effects for manipulating the sequences while they’re playing. The virtual instrument is called G8TOR and is available for purchase today under 2getheraudio’s Pay-What-You-Want business model. Like the name suggests, G8TOR starts its sound production with a fat and edgy sounding synthesizer. A supersaw oscillator, noise source and 2 virtual analog oscillators get the ball rolling followed by a resonant filter with envelope, modwheel and sequencer control. Further refinement includes mono mode with glide and built-in distortion, chorus, stereo delay and convolution reverb effects. The result is a synth capable of super fat basses, filtery pads, blistering leads and just about anything in between. Then comes the sequencer magic. G8TOR includes three programmable sequencers – an 8-step note sequencer, an 8-step filter sequencer and an powerful arpeggiator with per-step stutter, duration, velocity and filter control in addition to the standard arpeggiator controls. Suddenly, a single note from the G8TOR synth turns into an action sequence, driving bass line, or animated percussion track. To add even more variety (and avoid the static effect many step sequencers can impart), G8TOR includes eight tempo-sync’d pad effects. Simply start the sequence and trigger the pads for endless sonic variation. The pad effects include bit crusher, low/hi pass filter, flanger/phaser, fractal delay, panner, wah wah, stutter, and cut echo. The pads are MIDI controllable with per-pad trigger options that include one-shot, toggle, hold, mono aftertouch and poly aftertouch. A MIDI learn function helps you quickly assign each pad to an external MIDI controller. 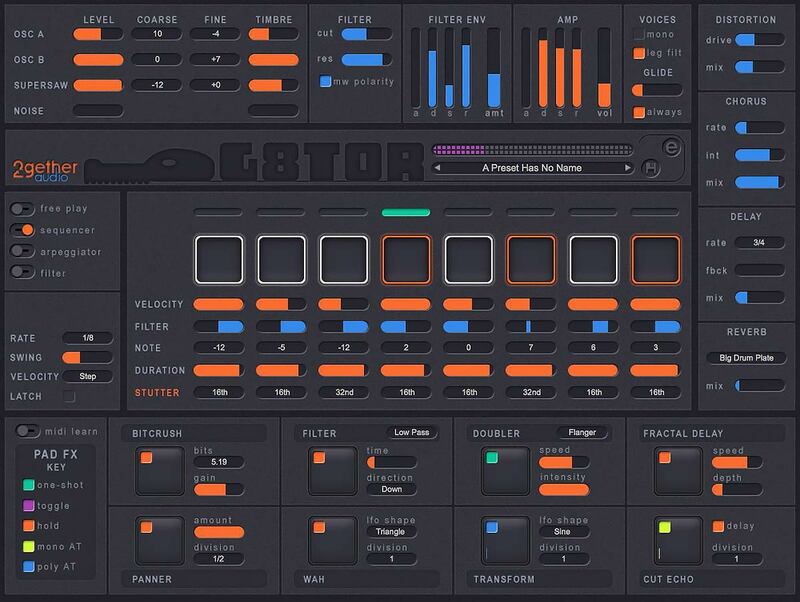 G8TOR supports 64-bit VST, AU, AAX capable DAWs and includes a Standalone app for use without a DAW. It is Mac and Windows compatible. G8TOR is released under 2getheraudio’s Pay-What-You-Want business model so nearly all musicians, regardless of their ability to pay, have access to this software. A free trial is available at https://www.2getheraudio.com/instruments/g8tor.